Facebook is releasing Home software that puts feeds from the social network on the home page of Android phones. Home software will act like a “wrapper” for the Android operating system and become the main way to use a phone. Notifications, images and messages will appear on the main screen of the phone instead of being accessible via a downloadable app. Facebook founder Mark Zuckerberg said the change would put people, not apps, at the heart of the mobile experience. In a presentation given at Facebook’s campus, Mark Zuckerberg said phone apps were a legacy of the computer world in which people clicked on an icon to start a program. While this worked well with desktops and laptops, it made less sense with phones, he said. “Now there’s a new use case that’s more and more important,” he said. Facebook’s Home software will hide apps and instead pipe all the content and chat carried on via the social network to the home screen. The software “wrapper” will also change the way that people swap messages or content by letting them respond by tapping on pop-up images, known as chat heads, rather than opening up apps and navigating through menus. Facebook Home will be available via Google’s Play Store as a download. The software will be available from April 12 on six phones – three from HTC and three from Samsung. Only four of these handsets are available now. The others are set to launch alongside Facebook Home. No information was given about whether home would be re-developed to work with Apple or Microsoft phones. Facebook said users could try the software rather than have to commit to use it all the time. Initially, the code will only be available for phones but a version for tablets is under development. Cory Ondrejka, Facebook’s head of engineering, said the company started its push to make everything it did centre on mobiles in early 2012. Figures from Facebook suggest that users spend about 25% of their time on their handsets looking at their feeds and chatting with friends. Facebook’s fourth quarter earnings revealed that about 23% of the money it made from advertising came from adverts shown to mobile users. 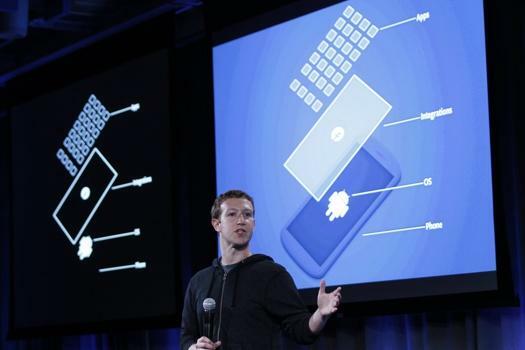 Prior to the news conference, many people speculated that Facebook would announce a branded handset. Mark Zuckerberg said Facebook shied away from doing this because even the best selling phones would only reach a small percentage of its user base. “This can start to be a change in the relationship that we have with how we use these computing devices,” he said.